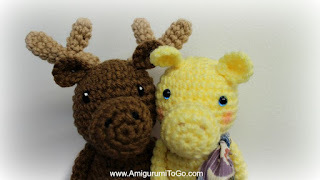 Meet the Wee Moose and his girlfriend! The Wee Moose is a member of my latest series called the Wee bits. They are about 5.5 inches tall depending on size of hook you use. 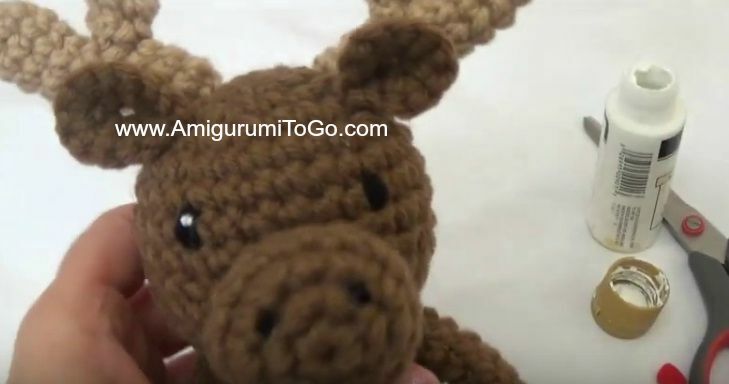 You can pick up the other animal pattern links in one post here and you can scroll down this page for the moose pattern. you can use felt, buttons, yarn or paint eyes on. I used 7.5mm safety eyes for the female moose and yarn for the male moose. If you plan on installing safety eyes with the backs then put those in between the 7th and 8th row with 5 visible stitches between them. Full video tutorial here, it follows along in the same order of this written pattern. sl st next st and f/o leaving a long tail for sewing. Add in the nostrils now, one whip stitch each should do it in between the 2nd and 3rd row. Stuff and shape the snout. 1) magic circle or an adjustable loop with 7st (7) begin with a longer starting tail you can sew into the head. f/o with a longer tail you can also sew into the head. After the mouth piece is sewn in, glue in a piece of felt for the tongue. 1) Stuff and shape snout. Pin the snout onto the face with the top of the snout on or about row 9. Use lots of pins.Put them in on a slant so you can easily sew around the snout without hitting the pins. 2) sew in the mouth directly under snout with wrong side toward the snout. After the mouth is sewn in place you can glue in a small piece of red felt for the tongue. 3) add in the eyes now if using yarn. Dab on the white paint after the rest of the parts are sewn in place so you can let the paint dry. 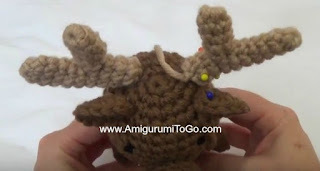 4) pin the ears and antlers onto the head. Make sure you are happy with the placement. remove everything but one ear then sew it on, then an antler behind it. Do same steps for other side. 5) sew on the tail. 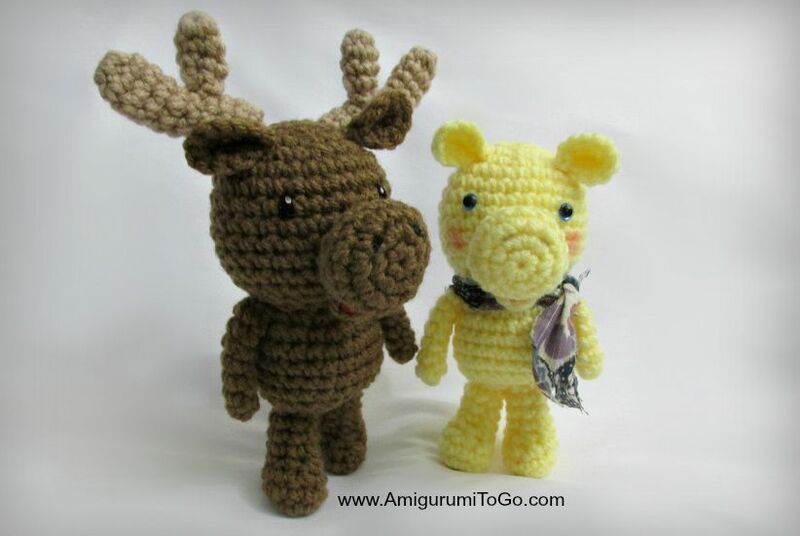 Remember to post pictures of your finished wee animal on my facebook page, Amigurumi Freely, I'd love to see. I talk about that in the video... I think I talk more about it in the koala video though. I used to have such a hard time working in those tiny rounds too. It definitely gets easier with practice. Also, relax as much as you can. If it gets frustrating just take a break. If you can't see the stitch from the top and don't know where to put the hook then turn it to the side and pull up so you stretch the last stitch you just put in and then you will be able to see more clearly where to go next. I hope that helps but if it's really hard and nothing I said helped then switch to a smaller hook and see if that makes it easier to get in there.. just for the 1st row of single crochets then switch back to the hook you were using. This couple looks adorable. I love the moose. Thank you for sharing this pattern and for all your other wonderful patterns to. I have made so many of you're works and I love them all. I saw that in this one your eyes had blue behind it and was wondering where yo lo get them and what size you get? Thank you I would love to hear back! Thank you I was also wondering about your cotton stuff you use. What kind? Your sewing needle just goes right through and I struggle with mine. And you little bodies they so soft an they like bounds back. Mine don't fit I put any pressure on it it gets deformed. 100% polyester stuffing. On the bag it says ideal for toys and pillows. It feels soft to the touch and springs back into shape when you squeeze it. I know the stuff you are speaking of. I bought some from a thrift store once and it was horrible but I don't remember the name. when I order from them I just send them an email and I don't use their form. I don't know their email off hand but it will be located somewhere on their website.. I don't know them personally but it has always worked for me when I do it that way. I'm so happy to have found your site. Thank you so much for sharing these adorable patterns! 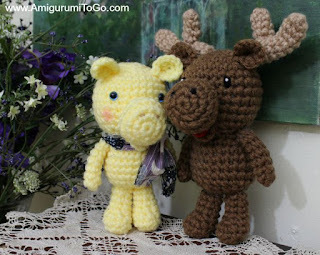 yes, I have the Little Bigfoot Moose and one called Large Moose. The large moose is the largest one I have. Scroll up, on the right side is a label list, you can click on moose OR scroll all the way up and on the right side is a search bar. Type in "Moose"